Gorgeous, love the yellows, so fresh and springlike. Sylvie Beautiful, paper, ribbon doilies, flower, beautiful card dear, your weekend sound wonderful..
Gorgeous... Love the simplicity of the colors. Beautiful card Sylvie, love that flower and all the details. this is so beautiful Sylvie...it would seem you've sent the rain our way today ! 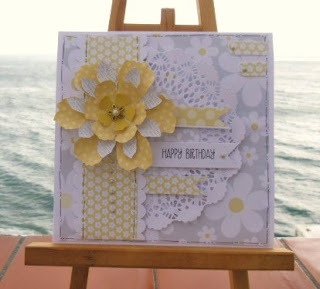 Really gorgeous Sylvie - you've used those papers beautifully! I've got a card on my post today using them too - great minds! That card is gorgeous! I love all those layers and the colors are so pretty! The yellow and subtle grey go so well together! Hello again! I haven't been to the Ally Pally before in fact I don't go any craft fairs as there aren't any near me in East Sussex. Is there one coming up, are you going? Stunning card Sylvie, so fresh and crisp. Love it!